Here is a screnshot of some Python code to illustrade the problem. The screenshot if of the Swedish interface, “förgrundsfärg” mean forground color and “bakgrundsfärg” mean background color. It seems to not change the foreground of any selected text. I know a workaround is changing the foreground of comments or background of selected text but I should not have to. As I’m not acquainted to Python Script, yet, I, just, can tell that you’ll have to use, in a new script, the two commands Editor.setSelFore(1, fore) and Editor.setSelBack(1, back), where, fore, and back are the decimal value, discussed above ! For the reset command, the NppExec command SCI_SENDMSG 2067 0 could be rewritten, with the Python script, editor.setSelFore(0,(0,0,0)). In that command, the triplet's colours are NOT taken in account. So, it’s easier to set them all to the 0 value ! does NOT restore the default selection background coloring. In fact, it seems to remove the coloring entirely, so that after it is executed, it doesn’t even appear that you are making a selection; but you are (you can delete/copy/cut/etc) the invisible selection! So, my first attempt to find out something, in Python script, by myself, was misinterpreted ? Well, it’s just my first lesson ! Nevertheless, Scott, just note that I spoke, in my previous post, of the editor.setSelFore(0,(0,0,0)) command, for the reset part and NOT of the editor.setSelBack(0,(0,0,0)) command. I’m may be wrong, but, as for me, the two commands editor.setSelFore(0,(0,0,0)) and editor.setSelFore(0,(255,0,0)) do restore the default highlighting of the current language ! I, also, updated, my previous post, too, speaking about a third possibility : the Lua Script ! An obvious followup question is why even have this setting if it does not work? 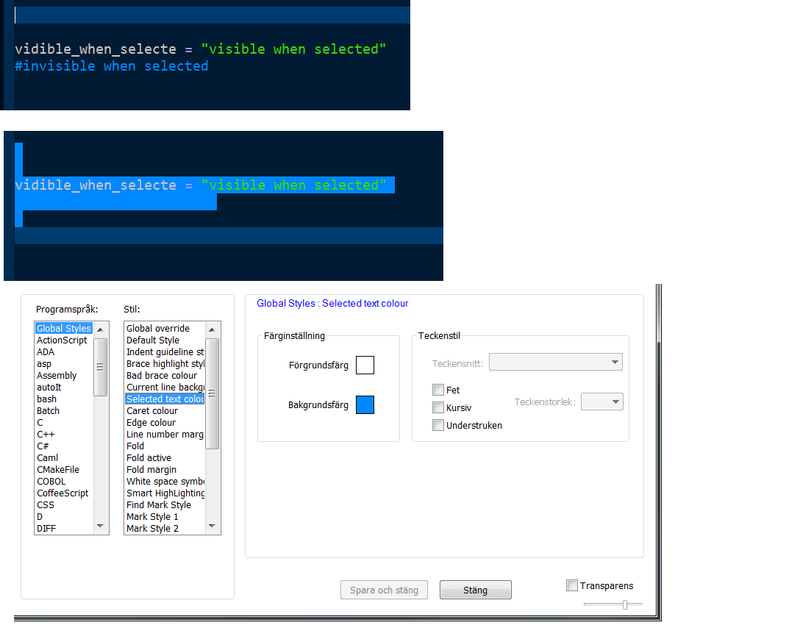 I excpect the option “Global Styles: Selected text colour” to mean "globally set colour of selected text ".